Could you use some extra cash in your pocket? I think we can all agree that more cash is always better! Right? 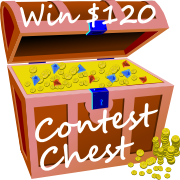 How would you like to win $120 cash money? To sweeten the deal, for sharing this giveaway with my readers, I could win too! That's right, if the winner entered the giveaway through my blog, I win too! **This giveaway is sponsored by Contest Chest. I was not compensated in any way for sharing this giveaway with my readers. I like to win and share great giveaways with my readers in hopes that they can win too!